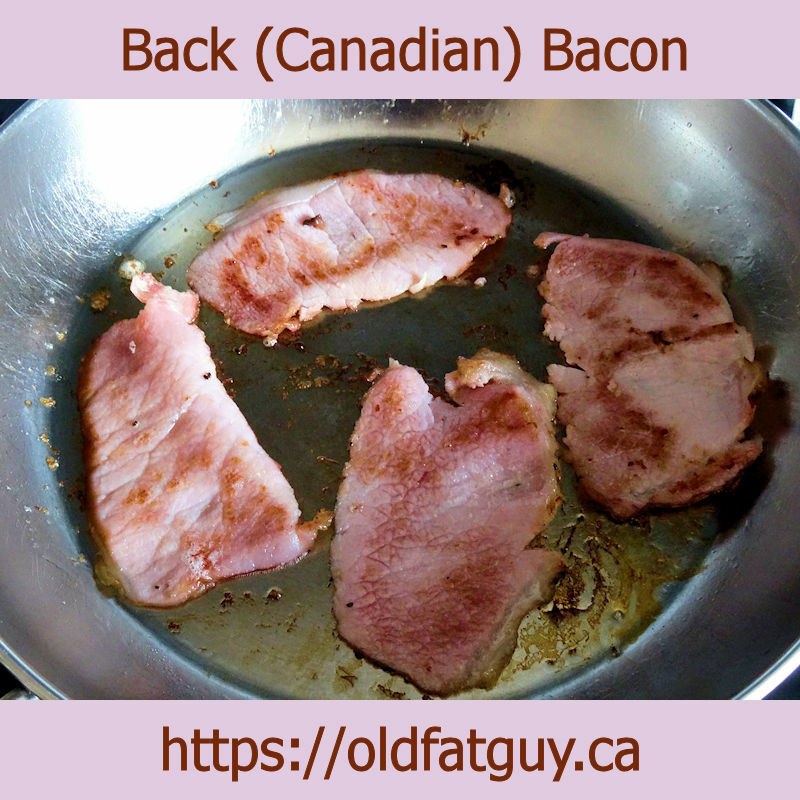 Most commercial bacon is made with a brine that is injected into pork. 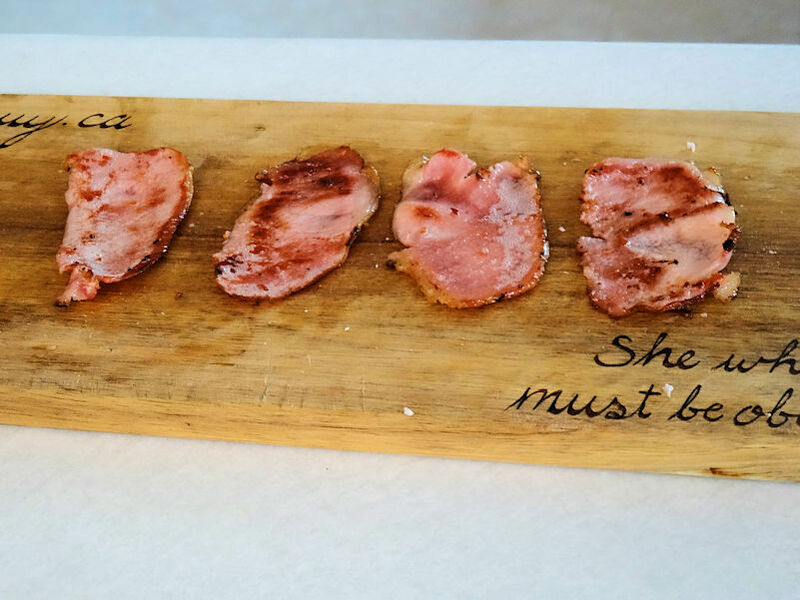 I prefer dry cured bacon. It is a little firmer and cooks up with a better texture in my opinion. That being said, my preference is based on personal choice. Many people prefer the softer wet cure bacon. They are not wrong, they just prefer the texture and taste. I have had some requests to do a video of how to wet cure bacon. Who am I to stick to my preferences. I made some wet cured bacon. It is delicious even though I prefer dry cured. I guess I’ll just have to enjoy it. The things I do for my readers. When you are wet curing, you put these ingredients into a brine and soak the pork in it to allow the ingredients to soak into the meat. You need to use the right amount of each ingredient to get a safe tasty result. This is determined by the weight of the pork and the water it will soak in. I started by weighing the two pieces of pork loin I was going to make into bacon. Then I put the pork in a non-reactive (stainless steel, plastic, ceramic, not metalic) container. I poured water over the pork until it is covered by one inch. Keep track of the amount of water you used. One litre of water weighs 1 kilogram and 1 quart of water weighs 2.09 pounds. Add the weight of the water to the weight of the pork. If you have a large enough scale, you could weigh them together. Once you know the total weight of the water and pork, you can measure the ingredients. Remove the pork from the water. Measure the thickest part of the pork in inches. Put the pork into the brine and put a plate on top of it. Cover the container. You calculate how long it will stay in the brine by multiplying thickness of the pork in inches by 4 days and add 2. For example, if the pork was 2 1/2 inches thick, you would multiply it by 4 and add 2 (12 days). Brine the pork and turn it every day or two. When the pork has brined, take it out and put it on a rack. I decided to make one of the loins pepper bacon and spread cracked pepper over the surface. It is important that the pork is dry before smoking. You can put it in the fridge uncovered over night, on a counter with a fan on it or in a 140 F oven until the surface is dry. Put in a 190 to 200 F smoker and smoke until the internal temperature is 140 F. At this temperature, the bacon still needs to be fried before serving but I think it gives a better texture. You can smoke it to an internal temperature of 150 F if you want to be able to eat it cold. Take the bacon out of the smoker and let it cool. Wrap it in plastic wrap an put it in the refrigerator for 1 to 2 days. Unwrap the bacon and slice. Freeze any you won’t be using in the next week. I fried up a slice of the wet cure bacon and pepper bacon. I also fried up some dry cured bacon and maple bacon. From left to right, maple dry cured, dry cure, pepper wet cure, wet cure. 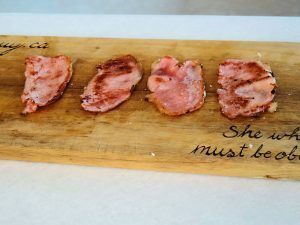 Here is a video of how to make wet cure bacon. The wet cure bacon is delicious. It is just a touch softer with less chew than the dry cure. There is a slight more saltiness to the dry cure and touch more sweetness to the wet cure. That being said. All of them are delicious. The differences are minor and it would be a matter of personal taste which you prefer. I suggest you make both and decide which you like better. 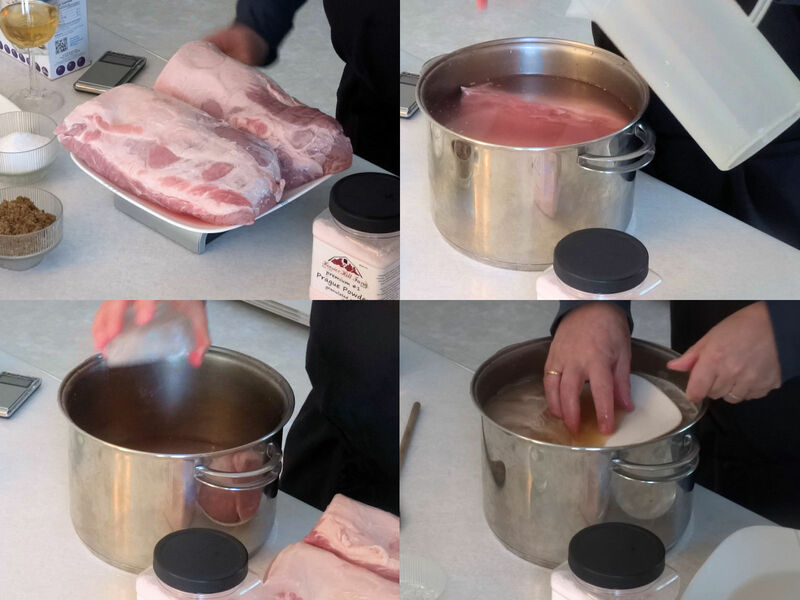 Determine the weight of the pork and enough water to cover the pork by 1 inch in a nonreactive container..
Add the appropriate amount of brown sugar, Kosher salt and pink salt #1 to the water and stir until dissolved. Put the pork in the brine and refrigerate for 4 days for each inch of thickness plus 2 days. Turn the pork every day or so. Remove the pork from the brine and dry the surface by putting in a rack in the fridge overnight. Smoke at 190 F to an internal temperature of 140 F (150 F if you want to be able to eat it cold). Let the bacon cool and wrap in plastic wrap. Refrigerate one to two days. Slice and freeze any that will not be used in the next 7 days. Great post! I looks absolutely amazing! Definitely going to try it out. Thank you for sharing and keep up the good work. Thanks so much for the kind words. If you need any help or have any questions trying the recipe, let me know.